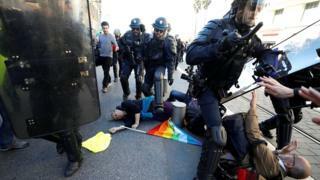 Geneviève Legay fell and hit her head on a metal post during the banned "yellow vest" demonstration in Nice. Protests had been banned in a large part of of the southern city's centre. The activist's family plan to file a complaint for wilful violence by armed persons holding public authority on a vulnerable person, their lawyer said. Soldiers were deployed for the first time during Saturday's protests to back up police and help maintain security. Protesters had been banned in the centres of many large French cities. After last week's riots, which resulted in more than 120 arrests, French President Emmanuel Macron had vowed "tough" action. Saturday's protests were largely peaceful and did not match the scale of those on 16 March, when boutiques and buildings in Paris along the Champs-Elysées were vandalised. Clashes also took place in cities including Lille, Lyon, Nantes, Toulouse and Montpellier. Concessions were offered to protesters late last year as the movement was picking up speed - including €10bn (£8.5bn; $11bn) designed to raise incomes of the poorest workers and pensioners. But this has not put an end to the discontent. For the past month, the president has toured France, listening to local mayors and citizens as part of his "grand débat" - or big national debate.